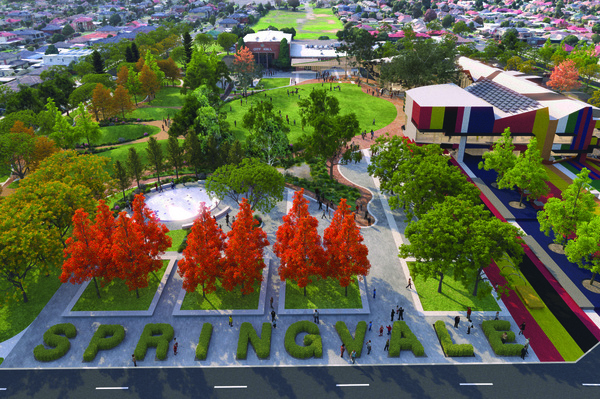 The proposed new Springvale Community Precinct. Springvale’s new community hub doesn’t “pass the pub test” and is a waste of money, according to councillor Tim Dark. He told the Monday 24 April Greater Dandenong Council meeting that constituents didn’t want the $40 million Springvale Road project and that it would create further council debt. “We are representing the poorest of the poor,” he said. But Cr Roz Blades said the hub would give the people of Springvale “the facilities that they deserve so that it can make their lives better”. “One way you keep people poor and uneducated is by not providing facilities for them to learn at,” she said. Seven votes to two, councillors approved plans to make the new hub carbon neutral and to demolish the Springvale Library, Springvale and District Historical Society and customer service centre. In their place by early 2020 will be a new library, multi-purpose community meeting spaces, outdoor green spaces and parking. The project comes from the Springvale Civic Masterplan, formed from community feedback, and was further shaped by community input last April. “Tim was talking about what people said to him during the election time,” Cr Blades told the Journal after the meeting. “That wasn’t what people were saying to me. “It’s not just a library we’re offering people. The existing library – one of the state’s busiest – and customer service building will continue to operate until the new building is operational. Cr Sean O’Reilly said the development would bring more people to Springvale and provide a better experience for residents. “There’s a lot of space in that area of Springvale but it’s not really used as well as it could be,” he said. He said Dandenong Library usage doubled within a few months of its relocation to the new Dandenong Civic Centre. “That could hardly be seen to be wasted, the money spent there,” he said. “With the learnings from Dandenong Library I’m sure that Springvale Library will be even better. Cr Youhorn Chea joined Cr Dark in voting against the proposal because he wanted to retain the old library, which had been a study hub for many new migrants. Cr Matthew Kirwan said retaining the current buildings would compromise the design. He applauded the decision to make the hub “one of only a few carbon neutral community buildings in Australia” and said it would save money by generating its own energy. “Some of them can’t afford computers at home,” he said. He said Springvale’s library was “going to impact low-income residents the most”. “We should see it as an investment, not just a single dollar cost,” he said.